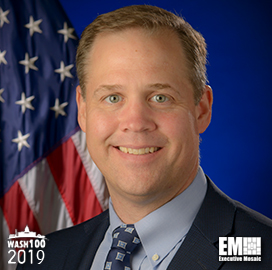 Executive Mosaic is pleased to introduce Jim Bridenstine, administrator of NASA, as an inductee into the 2019 Wash100 — Executive Mosaic’s annual selection of the most influential voices in the government contracting arena — for leading space exploration and weather forecasting research and ensuring the security of U.S. satellites. This honor marks the first Wash100 Award win for Bridenstine. Bridenstine was sworn in as the agency’s 13th administrator in April 2018. Previously he served as a member of the House Armed Services and Science, Space and Technology committees while representing Oklahoma’s 1st Congressional district. He also managed the Air and Space Museum in Tulsa, Okla. and flew the E-2C Hawkeye and F-18 Hornet aircraft during his time with the U.S. Navy. He previously expressed support for space exploration, weather forecasting research, a permanent U.S. lunar outpost and the security of U.S. satellites before becoming NASA administrator. Bridenstine joined the agency as it sharpens its focus on sending Americans to the moon. During his first six months as administrator, NASA worked on missions such as the Parker Solar Probe and the Transiting Exoplanet Survey Satellite, which seeks to discover exoplanets around nearby bright stars. In June 2018, NASA said the James Webb Space Telescope was slated for launch on March 30, 2021, after an independent review board recommended the implementation of additional actions including calling upon Northrop Grumman to take corrective steps as the project’s contractor. The telescope, which now costs $800M more to complete, was originally scheduled to launch in October 2018. “Despite major challenges, the board and NASA unanimously agree that Webb will achieve mission success with the implementation of the board’s recommendations, many of which already are underway,” Bridenstine said. After NASA announced the new launch date for James Webb, Bridenstine said an exchange of scientific data with China would lead to expanded knowledge between the two countries. Bridenstine cited “amazing scientific experiments” planned by the China National Space Agency, which are likely to be affected by CNSA chief Zhang Kejian’s proposal to establish a “cooperation list” comprised of experts from the two countries. In December, NASA contracted two firms to work on a potential eight-year, $264M technical support effort at the agency’s Armstrong Flight Research Center in California. Bridenstine has addressed climate change and the need for NASA to evaluate its contracting procedures and bolster accountability. Executive Mosaic congratulates Jim Bridenstine and the NASA team for their selection to receive this award.